The P-Series pumps are fitted with semi open impellers with Tungsten Carbide blades that cut large solids up during pumping. High torque 4 pole motors fitted. An adaptor bracket can be fitted to the pump discharge to facilitate the installation on FLYGT, HIDROSTAL, ROBOT and TSURUMI duck foot pedestals. 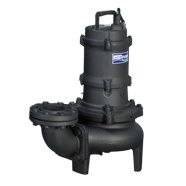 The U-Series pumps are fitted with recessed vortex impellers to facilitate pumping of water containing large solids. Submersible pumps for fixed (GRS) and portable installation in sewage lift stations, wastewater treatment facilities and animal husbandry applications. 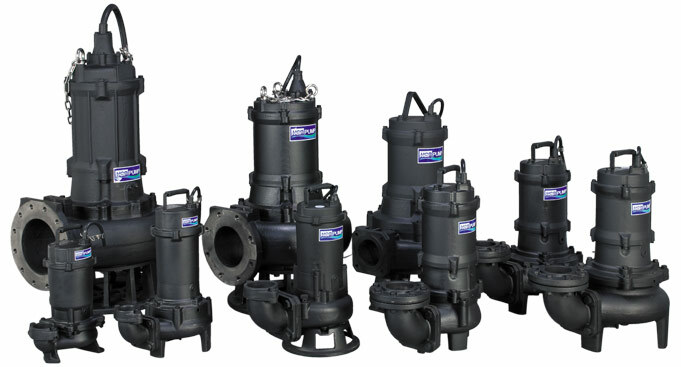 The P-Series pumps are fitted with semi open impellers to facilitate pumping of water containing large solids. Sewage lift stations, Waste transfer, wastewater treatment facilities, animal husbandry. The C-Series pumps are fitted with a serrated casing covers and semi open impellers with Tungsten Carbide blades that cut large solids up during pumping. Sewage lift stations, waster transfer containing large solids, wastewater treatment and animal husbandry. Sewage lift stations, wastewater treatment, factory waste water, storm water, raw water and animal husbandry.